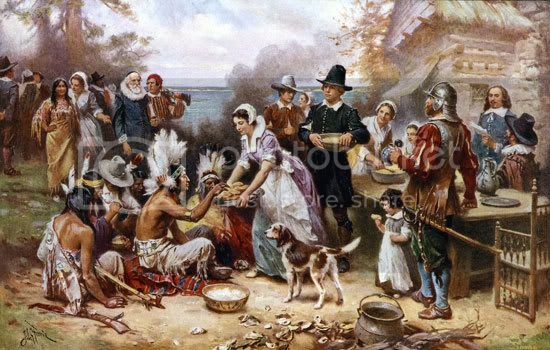 Did you know that the first [Plymouth Colony Pilgrim’s] Thanksgiving was a celebration of the triumph of private property and individual initiative? William Bradford was the governor of the original Pilgrim colony, founded at Plymouth in 1621. The colony was first organized on a communal basis, as their financiers required. Land was owned in common. The Pilgrims farmed communally, too, following the “from each according to his abilities, to each according to his needs” precept. The results were disastrous. Communism didn’t work any better 400 years ago than it does today. By 1623, the colony had suffered serious losses. Starvation was imminent. Bradford realized that the communal system encouraged and rewarded waste and laziness and inefficiency, and destroyed individual initiative. Desperate, he abolished it. He distributed private plots of land among the surviving Pilgrims, encouraging them to plant early and farm as individuals, not collectively. The results: a bountiful early harvest that saved the colonies. After the harvest, the Pilgrims celebrated with a day of Thanksgiving — on August 9th. Unfortunately, William Bradford’s diaries — in which he recorded the failure of the collectivist system and the triumph of private enterprise — were lost for many years. When Thanksgiving was later made a national holiday, the present November date was chosen. And the lesson the Pilgrims so painfully learned was, alas, not made a part of the holiday. Happily, Bradford’s diaries were later rediscovered. They’re available today in paperback. They tell the real story of Thanksgiving — how private property and individual initiative saved the Pilgrims. This Thanksgiving season, one of the many things I’m thankful for is our free market system (imperfectly realized as it is). And I’m also grateful that there are increasing numbers of Americans who are learning the importance of free markets, and who are working to replace government coercion with marketplace cooperation here in America and around the world. In the harvest feasts of 1621 and 1622, “all had their hungry bellies filled,” but only briefly. The prevailing condition during those years was not the abundance the official story claims, it was famine and death. The first “Thanksgiving” was not so much a celebration as it was the last meal of condemned men. But in subsequent years something changes. The harvest of 1623 was different. Suddenly, “instead of famine now God gave them plenty,” Bradford wrote, “and the face of things was changed, to the rejoicing of the hearts of many, for which they blessed God.” Thereafter, he wrote, “any general want or famine hath not been amongst them since to this day.” In fact, in 1624, so much food was produced that the colonists were able to begin exporting corn. After the poor harvest of 1622, writes Bradford, “they began to think how they might raise as much corn as they could, and obtain a better crop.” They began to question their form of economic organization. This had required that “all profits & benefits that are got by trade, working, fishing, or any other means” were to be placed in the common stock of the colony, and that, “all such persons as are of this colony, are to have their meat, drink, apparel, and all provisions out of the common stock.” A person was to put into the common stock all he could, and take out only what he needed. This “from each according to his ability, to each according to his need” was an early form of socialism, and it is why the Pilgrims were starving. Bradford writes that “young men that are most able and fit for labor and service” complained about being forced to “spend their time and strength to work for other men’s wives and children.” Also, “the strong, or man of parts, had no more in division of victuals and clothes, than he that was weak.” So the young and strong refused to work and the total amount of food produced was never adequate. Many early groups of colonists set up socialist states, all with the same terrible results. At Jamestown, established in 1607, out of every shipload of settlers that arrived, less than half would survive their first twelve months in America. Most of the work was being done by only one-fifth of the men, the other four-fifths choosing to be parasites. In the winter of 1609-10, called “The Starving Time,” the population fell from five-hundred to sixty. Mr. Maybury writes on investments. This article originally appeared in The Free Market, November 1985. Here is a direct link to the story http://mises.org/story/336.